The Chinese zodiac is thousands of years old, so what better decoration for your glossy, state-of the-art PC? 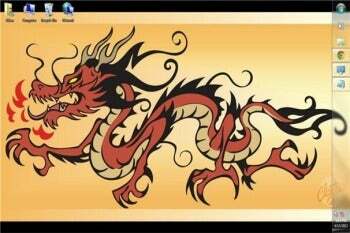 The twelve zodiac animals make a stately parade across your Windows 7 desktop with the Chinese Zodiac Windows 7 Theme. PCWorld editor Kim Saccio-Kent selected these wallpapers from the many available at deviantART, an online community showcasing user-created art and photography. 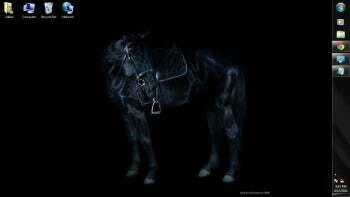 DeviantART user immanuel's horse seems to stand on thin air. The wallpapers depict all the animal signs in the Chinese zodiac and follow the twelve-part cycle, beginning with user kacza-ino's image of a rat and ending with MPtribe's tattoo design of a pig. Each of the images is striking in its own way; many use contrast to show the beauty and power of the animals. Most impressive is a close-up of the piercing eye of a tiger. User fennecx's big cat is nestled in a fiery golden coat, with ripples of black and white. KalleVictor's snake has a sublime appeal, with its lush scales of varying green tones against a background of darkness. Other deviantART images include the Chinese zodiac ox by KatVonB, the rabbit by Vajk, the Chinese dragon by orgastic, the horse by immanuel, the sheep by inoxorum, the monkey by SubterfugeMalaises, the rooster by Iceandsnow, and the dog by branka42. For obvious reasons, deviantART user orgastic's dragon is one of the only images in the pack that isn't a photograph. In addition to the unique images, the Chinese Zodiac 2012 Windows 7 desktop theme features sound effects from members of the Freesound.org online collective. Reinsamba's work starts Windows with the vibrant, hollow sound of a gong, and Gorgoroth6669 shuts it down to the mellifluous tune of a Chinese flute.